Friday afternoon, under beautiful sunny skies, I took a brief field trip to Finley Wildlife Refuge. The refuge is located south of Corvallis on 99W. 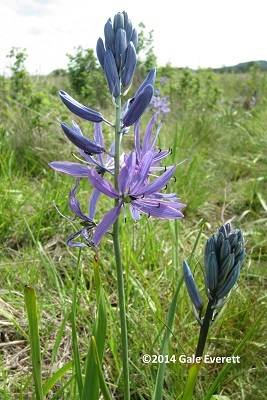 My buddy Harry had told me about a road filled with blooming camas. Of course, that was last weekend and I wasn’t certain how much blooming continued due to the recent burst of high temps. I discovered many plants still blooming and beautiful. You’ll be seeing many renditions of this flower over the coming months. (Hint: it has something to do with my proposal for Art in Rural Storefronts) I was able to take photos of all stages: from tight buds emerging to spent flowers with seed heads forming. I really wanted to sit and sketch but had forgotten my paper and time was short due to an early dinner date. Photos will have to suffice for now. Bald Hill path and Homestead loop in Mac Forest have some beautiful examples these days too!